EU Casino provides a huge selection of top games, which you can play for fun or real money. Using the safest security protocols, the most sophisticated random number generators and tested extensively to provide fair play, EU Casino is the perfect place to go for a European jolly. Bring us back a wicker donkey, will you? EU Casino runs on the relatively uncommon SkillonNet Software, which means you will find plenty of games you have never seen before. Look out for outstanding 3-D slots, jackpot slots, 10-50 line slots, and lots more slots besides (they like their slots. Lots.) Card games include numerous types of blackjack, craps, Pai Gow and Punte Banco. 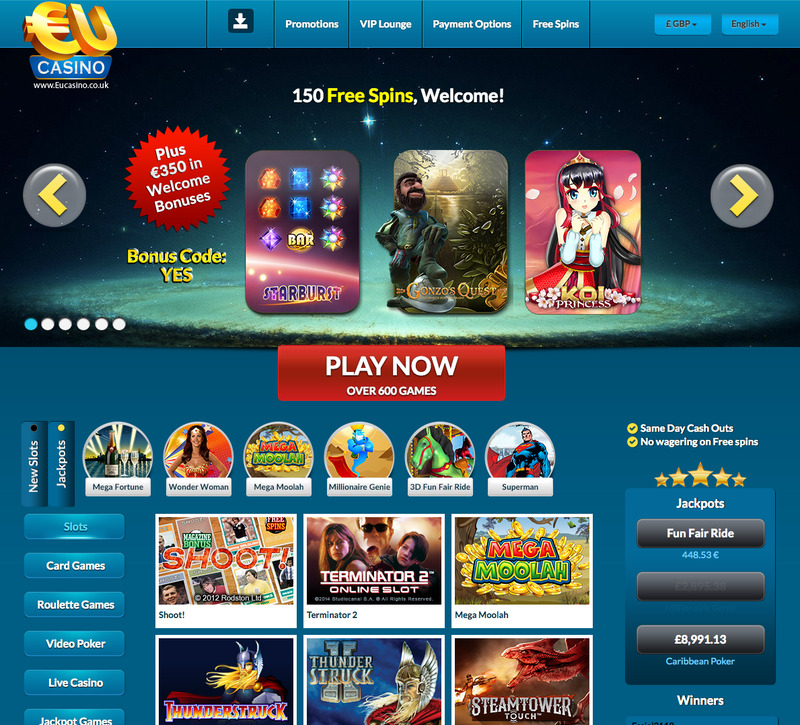 EU Casino also offers games from other software providers including Microgaming, NetEnt, Cryptologic and WMS. There are five types of roulette - European, American, French, and two lesser-known variations, and if you are a fan of video poker, there are four different varieties. Games are available to preview before you play. Always nice to have a little nosy before you commit - you won't be disappointed though. EU Casino runs on SkillOnNet. It's not one of the most common software providers, but it's good, trustworthy and reliable. Other software providers improve the games offering - graphics are okay, sound effects reasonable. You know when you go on holiday, and the streets look, well, different? You will find that at EU Casino. It has a distinctively ‘European’ vibe about it, which is hard to explain - you will see when you get there. It's simple to navigate around, looks good, and has plenty of instructions for the new player. As a VIP, look out for cash back on every bet you make, a personal VIP account manager, huge bonus offers, free cash for testing new games, and free bonuses for moving up the levels. If you make it up to the dizzy heights of Executive Level, you could be jetting off for a luxury holiday, or sipping champagne at a world famous sporting event. Sterling, Canadian dollar, Australian dollar, several Scandinavian currencies and the Russian ruble. There is a great variety of web wallets too -- take your pick and get playing. American players not accepted. Your details are as safe as, er, villas at EU Casino. They use industry-standard security protocols to ensure all transactions are carried out in a secure manner, and the casino utilises a number generator to ensure consistently random results. The sophisticated system has been extensively tested by analysing millions of shuffles, spins, and throws. You can view the testing certificate online. The casino regularly monitors ongoing gameplay, and ensures that levels of fairness are maintained at all time. EU Casino is based in Limassol, Cyprus and is licensed by Malta Gaming Authority.